Am I the only person simply beside myself that it is the end of March already? How did this happen? How are we now squarely in the true season of spring and already flirting with summer temps? How is it that plans for how to recreate the kiddos during summer vacation are already underway, prime camping spots in the White Mts. are already booked for June and class schedules for NEXT school year are already registered for? I know they say as you get older the time seems to go faster and the advice is to relish every bit of it you can. When we take a good hard look at the time we logistically have left with two sons living under our roof, my heart races and I begin to panic about all of the experiences we still have yet to have with them. The “bucket list” so to speak, begins to look daunting. Every year around January 1st I sit down and make a list of “intentions” (not resolutions but more thoughtful genuine goals) for different areas of our life. Parenting is one of those areas that gets a lot of pondering in the New Year. As much parenting of teenagers advise as I can cram in- the basic foundation of all that sound sage always circles back to “being intentional.” I have written about our “Fit Family Fun” goals for the year a few times already- those are meant to sculpt and mold our bodies and help reshape our minds about the lifestyle choices we make. Jason and I both plugged in at Sun Valley as youth leaders in junior high and high school as a way to help shape the boys (and our own) hearts spiritually. Along those goals we have really tried to instill charity and generosity in the boys and we have been praying about having a family perspective experience together to truly let those lessons sink in. So coming this fall, we will get a huge check mark on a big ticket item on our Parenting Bucket List. I plan to blog about our journey as much as I can beginning now. I hope to share with all of you about the logistical leg work, our fundraising efforts, our prayer requests and much more over the coming months. I know as a family that will be embarking on this journey with a special needs teenager our perspective along the way may be unique and valuable to others that find themselves in similar life circumstances. Maybe one of the ways God plans to use us on this trip is to encourage others like us that keep saying “but” to listen for their own “Go.” Maybe he plans to have someone meet His Son through a conversation with one of us, and maybe He plans to break off some of the hardening around our own hearts that we have selfishly clung to. Who knows- but I am excited to find out what it is- whatever it will be. We will be going with a short term Mission Team from Sun Valley Community Church in partnership with Back2Back Ministry. Back 2 Back exists to love and care for vulnerable children, by meeting their spiritual, physical, educational, emotional and social needs so that they might overcome their life circumstances and break free from the cycle of generational poverty. 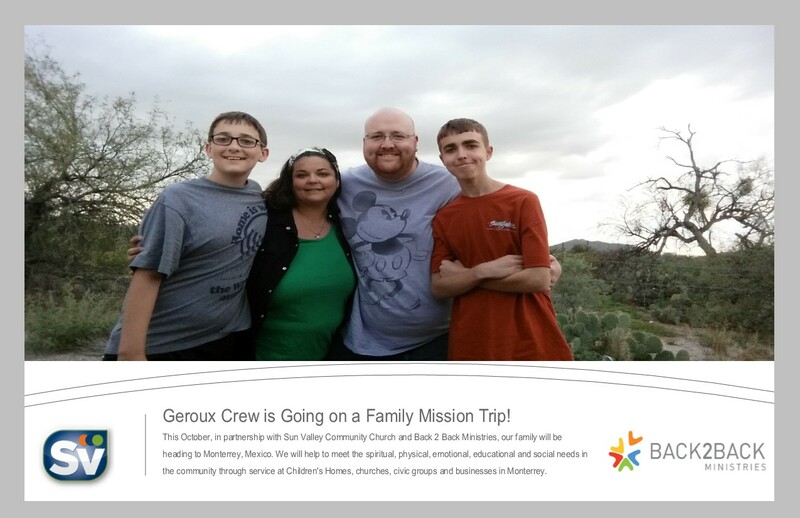 In order to help make this trip a reality, we are in charge of raising a total of $5,800 to cover the costs for all four member of The Geroux Crew to participate. We are trying to do this in a number of creative ways (and we will share more about those soon), but we are also looking for people to join us on this journey. If you would be willing to make a financial contribution to our trip, you can do so by visiting www.sunvalleycc.com/onlinegiving and making an online donation using a debit card, credit card, or e-check. 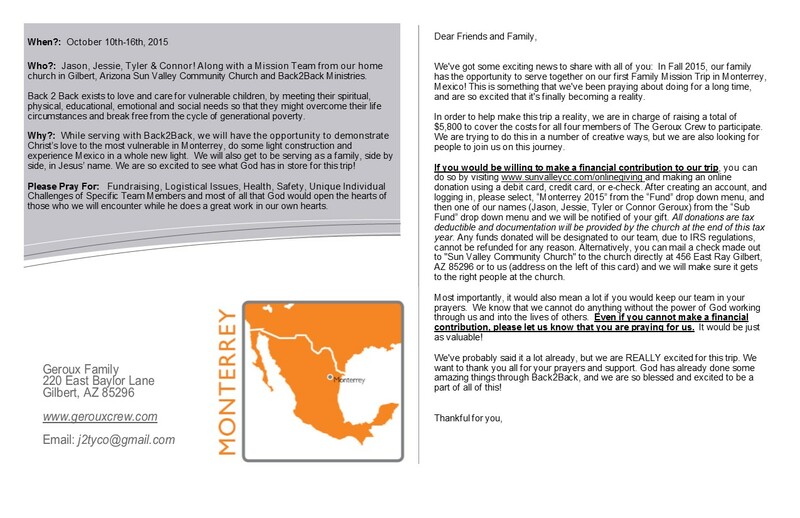 After creating an account, and logging in, please select, “Monterrey 2015” from the “Fund” drop down menu, and then one of our names (Jason, Jessie, Tyler or Connor Geroux) from the “Sub Fund” drop down menu and we will be notified of your gift. All donations are tax deductible and documentation will be provided by the church at the end of this tax year. Any funds donated will be designated to our team, due to IRS regulations, cannot be refunded for any reason. Alternatively, you can mail a check made out to “Sun Valley Community Church” with our names in the memo space and send it to the church directly at 456 E Ray Rd, Gilbert, AZ 85296. Will you consider joining us on this journey in prayer? There are many tasks to complete and ducks to get in a row between now and October so prayers for all of the logistics to go smoothly would be greatly appreciated. Our special needs are not the only unique individual challenges on the team that will be traveling. Many members have their own hurdles to overcome to make this trip a reality for them and theirs as well. Prayers for health and safety are also greatly appreciated. Even if you cannot make a financial contribution, please let us know that you are praying for us. It would be just as valuable! We know this journey, this step to be obedient to God will season our lives and we can not wait to share those flavors with all of you. Thank you for reading this far. Simply put- we won’t be able to do with with support. Both financially and spiritually in the form of prayer so we thank you in adavance for walking along side us!